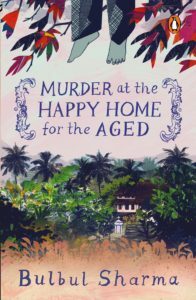 This is a murder set in a rambling old house in Goa, the Indian equivalent of an English country house. The Happy Home for the Aged is just that, a place with a group of elderly residents including a Russian artist called Yuri and owned by a pretty girl named Maria who is still unmarried at the age of 39 plus with the help of Leela who cooks and cleans. The placed lives of the residents, normally punctuated by food and squabbles, is disrupted by the discovery of a body hanging from the mango tree in the garden one bright morning. The body is dressed in male clothes but turns out to be that of a woman whom no one seems to recognise. The fat Police Inspector Chand is more interested in ogling Maria than solving the murder so the residents of the Home decide to put their collective wits to work. Bulbul Sharma’s lighthearted style captures the essence of life in Goa, touches of Portugese history and culture, life on the beaches and in the spice gardens and the influx of foreigners, mainly Russian, who are on the take in many cases as well as moneyed folk from Mumbai and Delhi looking to build luxury homes at throwaway prices. Outside the boundaries of the Happy Home the Goa she describes has a predilection for party drugs with coke sniffing and bloodstained shirts and wine stained dresses – much of which hits the national papers from time to time. Goa is, after all, the place where the golden sand and the good life has a nasty edge. Sharma also points out the caste and religious differences that exist – the Hindu policeman for example has a mother who is against his eyeing a Catholic girl and there is always the clash between the true Portuguese as compared to those residents with mixed bloodlines. The quest for the murderer is paralleled by Maria’s quest for love and in the end; she chooses good heartedness and a loyal Goan boy over gold digging – her first beau Francis is only after the house that he plans to turn into a heritage hotel after turfing out the geriatric inhabitants. In an India with an increasingly silver haired population, Sharma makes the point that age has nothing to do with incapacity. Rosie, the eldest, can pull off an Olympic leap with her wheelchair when it comes to the point, regardless of the consequences. Deven and Cyrilo can manage action and even if none of them has Miss Marple’s insightful talents, together they make a sympathetic team aided and abetted by Maria and her true love Bobby, capable of fighting off genuine evil with effects borrowed from the film Mirch Masala. They also succeed in making Inspector Chand look like an idiot, despite being advised by the cops to concentrate on singing bhajans rather than murder mysteries. Whether this is the first of a series or a tale complete in itself only time will tell.